Working with Bespoke for our wedding catering was a truly wonderful experience. Kirsty, our events manager, handled everything from our enquiry, to the tasting, right up to our wedding day with so much enthusiasm and care. Bespoke honestly deliver a service that is unique in every aspect to the couple they’re working with. They dealt effortlessly with our dietary restrictions (gluten free + dairy free – not an easy feat!) and created a personalised menu combining our Scottish heritage and Ukrainian roots. Kirsty even included an old family recipe to make our starter! From the get-go, the staff understood that we wanted a cosy, ‘family-style’ feel for our wedding, especially the meal, and they worked tirelessly to make this a reality. On the actual wedding day, Kirsty and her staff were beyond attentive and helpful. They made sure we were taken care of (including setting aside specific bride and groom plates for canapes and evening food because they knew we would be too busy to get to it ourselves), and they made sure our guests had everything they needed. 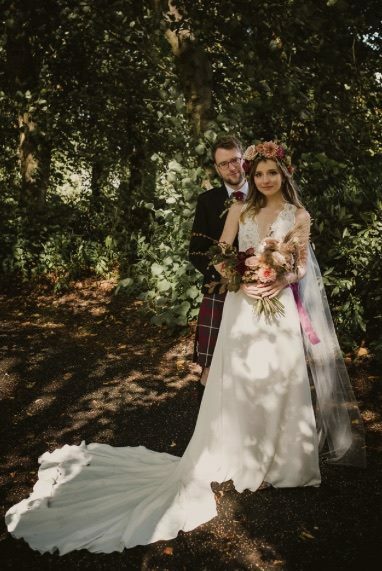 We can’t thank Bespoke enough for everything they did to make our wedding an amazing day that we will always remember.